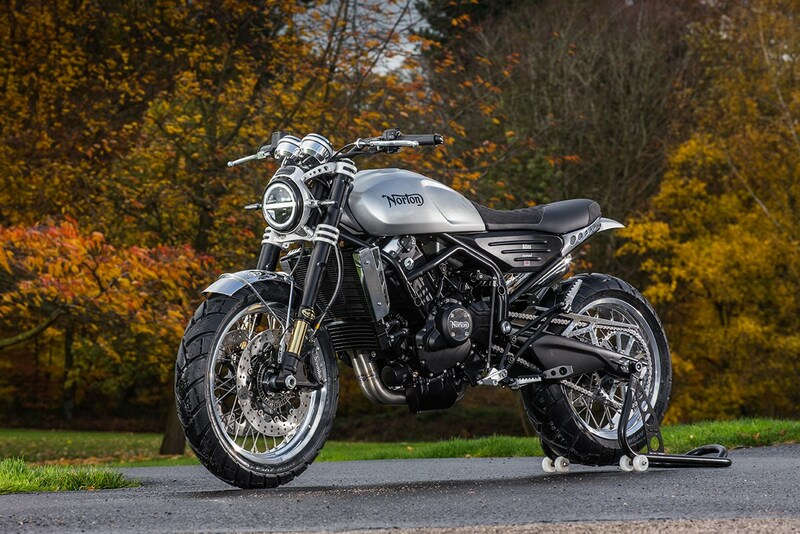 Norton Motorcycles unveiled earlier today the 650cc Atlas models pictured, including the Atlas Nomad and Atlas Ranger. Powered by a parallel-twin with a 270° crank, the Atlas machines have impressive performance specifications, which arguably eclipse competitive scrambler models from Ducati and Triumph. Claimed peak horsepower is 84 at a lofty 11,000 rpm, with 47 foot/pounds of torque at an unspecified rpm level. This bike will be a revver for a mid-displacement twin. Together with the generous power claimed is a dry weight of just 392 pounds. Of the two models, the Ranger is the more dirt focused, with a 19″ front wheel (the Nomad has an 18″ front). The adjustable suspension and Brembo brakes are upscale items, and it is all held together by a steel trellis frame. 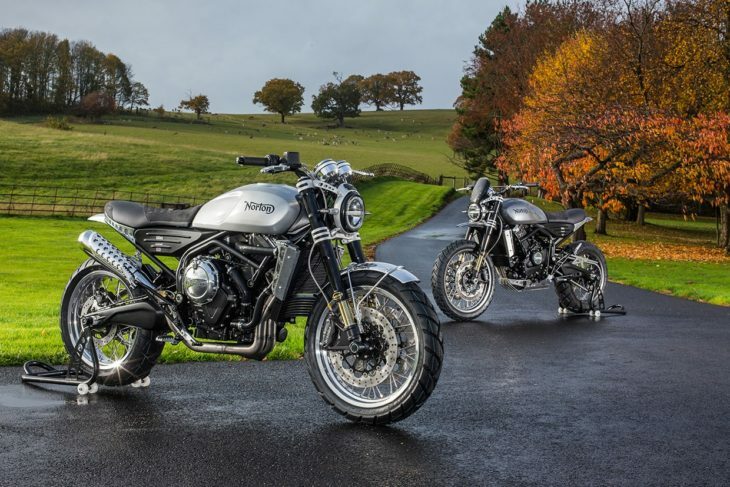 Norton says it plans to produce a significant volume (for them) of each model with relatively aggressive pricing, which will be £9,995 for the Nomad and £11,995 for the Ranger. The less expensive Nomad converts to roughly $13,000 U.S. at today’s exchange rate, so we are not so sure how “aggressive” this pricing is. Enjoy the photos – the Ranger is the model with the higher front fender, while the Nomad has the front fender hugging a more street-oriented tire. Why has the correction not been made. The picture of the dials clearly show a redline of 7500 rpm, and yet the article states an 11000 rpm redline. I would think this needs to be made clear. Recently had a ride on a 650 Ninja that was sewing machine efficient, so to speak, but totally lacking in any kind of vertical twin torque. I really hope that when the test rides come out for this they will find a way of communicating how that torque is delivered and perhaps compare it to what the 650 Enfield offers. I prefer the spec on this one but the looks of the Enfield. Their website shows a total of four (4) US dealerships = Unobtainium for about 80% of the country. Not a very strong business plan, if any level of success is expected. They always have nice looking vaporware though. I would also like to question the closest one, just what inventory do they have on the floor, since their web site does not show any. Just called one of the 4 dealerships in America and they have 3 on the floor. Not bad for a special bike, however I was surprised to find that they have been in production for a couple years plus. Talkin the 961 cc vert twin. I like the looks (of the Ranger) and I’m sure it would be fun to own one but the thought of dumping it (entirely possible) on a dirt road or scratching it up on a tree lined 2 track makes my stomach hurt. I would prefer a scrambler that could be banged around without sending me into a decade long state of depression. One trend that I like in the current motorcycle industry. Is that it seems to be figuring out that all the horsepower wars over then years have given them the ability to bring parallel twins back for the grave. They are compact, narrow, light, they have a low parts count and they even make pleasant noise. Their very nature also allows the manufacturer to style the bike very easily. The one thing that I find odd about this particular engine is where they located the shift drum within it. When has it ever been a good idea to locate the shift drum on the top of a motorcycle engine? Even if the bikes are real, the dealer network and warranty are most likely vaporware. I suppose the in thing is to take a once respected name and sponge off it by making something new for more money (with said nameplate) than it would be if you just started a new motorcycle company? Victory is gone and now we have, what…the third or fourth version of Indian (but it looks like they may have succeeded this time!)? These two bikes look nice but they’re not worth the asking money for normal folk. Most people that remember Norton also remember Ralph Kramden before they ever even think about the motorbike marque. As said elsewhere by someone that understands this market, Royal Enfield will sell a ton more bikes that will see road time than this foo-foo boo-hoo boutique marque ever will. A rose by any other name would smell as sweet and a motorbike whose claim to fame is about as genuine as Elizabeth Warren’s “heritage” is not going to make anyone reach for their wallet. Good looking machines and I would happily own one, so maybe Im not a purist and should ignore the fact that I own a mk3 and a Model 7. As for cost, in my neck of the woods £10000 is about what you are looking at for a mint mk3 (if you can find one). This bike isn’t for the purist, it’s for someone trying to emulate purity. Any purist can go right now to Craigslist and choose between a number of Nortons, Matchless, Triumphs, and old airhead twins for less than six grand. Are these bikes supposed to practically useful? I mean, they’re scrambler styled, so presumably they’re meant to be ridden in all condition and weather? If so, the fenders at both ends look laughably inadequate to me. The front fender (half fender, if you’re talking about the high one) is much too small to keep most road spray (and mud, etc) off the lower half of the engine. At the rear, there doesn’t appear to be a full fender liner under the seat, or a hugger on the rear wheel. They look really cool, but also a lot like something turned out by some customizer who has thrown practicality out the window. Really…? These bikes are beautiful and nicer looking than anything else in their class. You will always pay more for bikes from a smaller more exclusive manufacturer that builds by hand. Yes, there are other good bikes for less to be had, so if $13K is too rich for your blood, your SV650 or some other mass produced bike awaits you. Compare it to a KTM 790 Duke at £1500 less. Hmmm…. I am appreciating Triumph more and more as they have kept their classic line looking like they are a natural progression from their classics of old. But the new Royal Enfield twins are very tempting considering their price-point and thoroughly modern engine technology. I will continue to wait and see what the new Mahindra BSA’s look like. 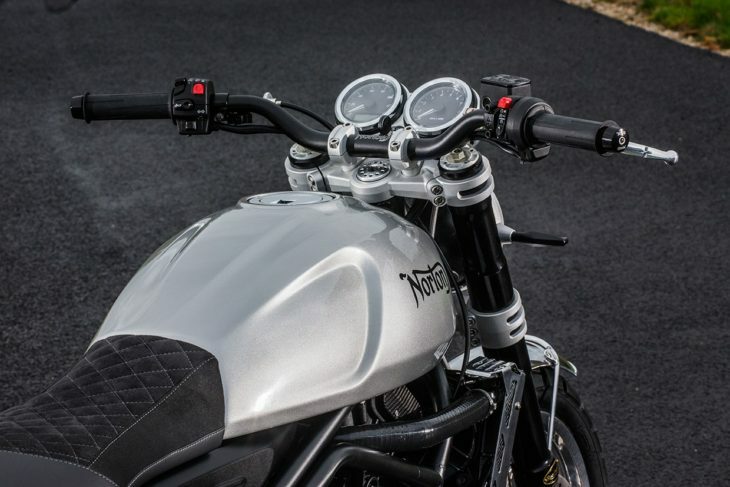 In all honesty I think Royal Enfield will sell 50 of their new 650 twins for every one of these that Norton sells. Could the RE’s really be that functionally different, under real-world riding conditions, in the motorcycling experience they provide? I think not. But you could buy two of the RE’s for the price of one Norton. 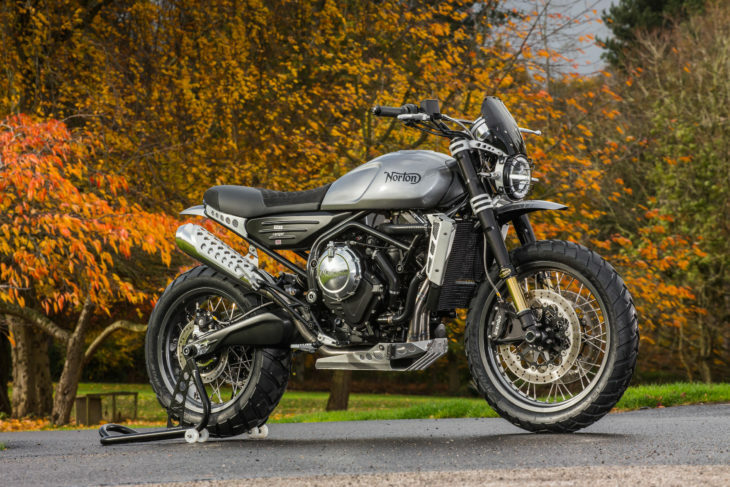 Hey Norton, why not create an ‘affordable’ nostalgia bike? One that hearkens back to the glory days of British biking through classic design, instead of trying to establish another new niche for the super-rich? How did that work out for Motus? Get some sales and dealers, establish a footprint in the industry, THEN start selling over-priced niche bikes to those who can afford them. Just a thought. I have to think on real world roads the difference between the two bikes would be significant. The difference in price buys a lot more motorcycle, and I’m sure British labor costs are higher than Indian. Don’t get me wrong, the Royal Enfield twins look like fun and inexpensive bikes but they save costs by attaching low end components that look straight out of the 70s and 80s. Just compare the frames and swingarms. This Nortons are in an entirely different class for those that are willing to pay the premium. I’ll add that the Atlas bikes look awesome. Hear hear . RE has a solid rep of crap, with fewer dealers now. Norton 650 is a new bike with no reputation of reliability set yet, and very few dealers. A low rate of production demands high prices, which might work if the product naturally sold the IDEA — and was desireable, and unique. Looks good – works good – is good. I would love to have an air cooled Norton 961, if there was a dealer near by and they cost less. Any thing over $10k should have 4 wheels, an am radio, and at least a bikini top. You’d HAVE to buy 2 RE’s. This way you can still ride one while you’re repairing the other. Reality Check: Royal Enfield dominates(!) it’s gigantic home market in India with the thick end of one million units per year whilst Norton is almost literally a cottage industry batch building almost, from a kit of bought in parts. RE makes and sells its’ bikes at and for prices its customers in India can support whilst Norton is really a “fashion Brand” now with all that entails for costs marketing. It is ironic that old British brands are being mined by new Asian entrants with no history behind them whilst Royal Enfield sold the rights to their brand to a third world Asian country many decades ago which somehow endured and are now prospering – in the British market amongst others! For some reason I can’t quite put my finger on, they have a certain concept bike look to them. Those head pipes seem rather large for a 650 twin also. If I were to pick one it would be the Nomad. To sell very many of these, the price mentioned would have to be lower by 20% in my opinion. But as it stands now, if I were in the market for a scrambler, Triumph would get my money. Very nice looking motorcycles imo. I could see riding something like these. Don’t they need things like mirrors and turn signals and tail lights? I have yet to see one of the “new” Nortons on the road, and honestly weren’t sure if they were still in business.Guess they are. On the other hand I still see a mid 70’s Norton running around from time to time. If my math is correct that Colorado Norton (without core bike) is $32 k.
Well the tank is real nice. Rest of it looks as cobbled together as most bikes today. No flow to the style at all. Pass. Nice looking machines. Light weight. Power. Classic looks. Right up my alley. I like the Range. Nice looking bike. I don’t know if I would buy it over a Triumph,Ducati or BMW Scrambler. All in the same ball park price wise. All have better dealer networks too. I would be concerned about reliability and parts availablity. The bike looks like it has a hard ride from watching the video. I would need a test ride. This is the second posting I’ve seen reference a video with no link. I’m viewing this on my phone, maybe the video links don’t show up on small devices? Look like crazy high is that engine. That will be very unstable motorcycle while cruising. This is not a Norton as I knew it (low down torque single); for me this is not Norton. Something’s crazy high, but not the bike. 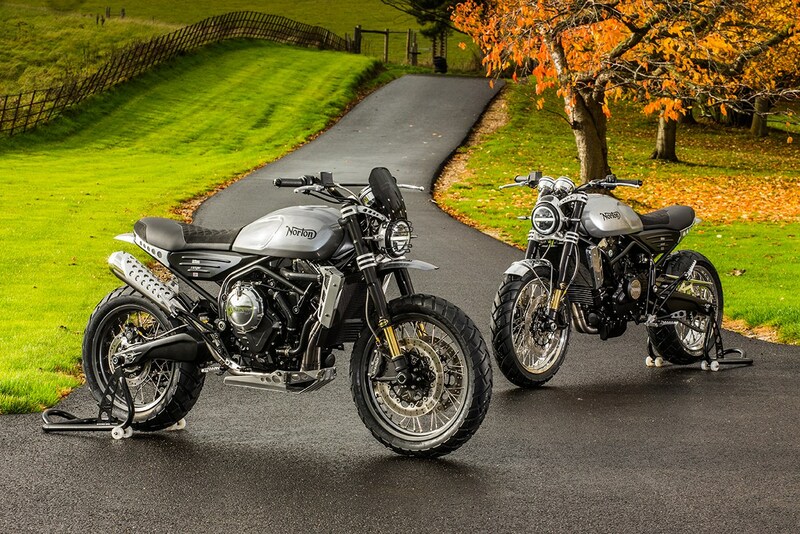 The one in the foreground is the scrambler model with the taller suspension – the one in the background is the pure street model. Most people do not eve remember a Norton single – you’re a purist’s purist 🙂 Not a big niche for sales. Where are the tail/brake light and rear turn indicators and license plate holder, not to mention the mirrors. It is cheating to present this as a production model when you are trying to score a few free points in the looks department. Good way to make me suspicious of any other claims by the manufacturer. As for that lame video, well, it is lame. stick on the back of your helmet. Lightweight, powerful, good looking. If only they had a decent dealer network (boutique bikes tend to need warranty work) and a bit more reasonable pricing. I know, I know, these are “special” so the price reflects that. Try telling/selling that to 90% of the riders out there. None of this is affordable and it cannot be given R&D expense and low production numbers. About as “affordable” as BMW. $13k is the least expensive estimate. The BMW was about 20k, the base scrambler is a lot less, but can quickly get up there, as can the Triumphs. To my taste, with a high revving modern engine and a nice amount of torque – this looks like the most fun of the bunch. The proof is in the pudding, but this is a very competitive machine. “competitive”, yes when the tests come out, it will be interesting. I doubt this is going to be at the top. Whatever styling this has, it seems to be much like a concept bike (i know its production) with flat plate and holes drilled, looking much like personal fabrication, I doubt will still be in fashion next year, when it comes out. I’m not sure what is competitive, the price? styling? 50 torque and 80 hp, out of a 650, but at 11k? whats it like at 3k-6k where one usually rides? some of the new models, I dont like, this is not THAT bad, but cant you buy a Yamaha MT10 for $13k? twice the bike, eh. or a MT07 for 8k, half price of the more expensive norton? Many often buy something only hundreds cheaper, thousands of dollars higher, this thing better come with magic dust, which i doubt it does. Damn, tough crowd the most of you are. Considering some of the hideous customs I’ve seen here on MD, these really aren’t bad looking. Considering the small volume from a manufacturer just trying to get going again, the pricing for what I’m seeing you get IS aggressive in these what will sure to be small numbers. Norton is trying to cash in on the scrambler market apparently, and I think it’s a great attempt. The m/c market has been very tough and super saturated, so any one trying to build up is going to have quite a time. Even Suzuki almost went belly up not that many years ago. Just how long are they going to “just trying to get going again”? Been hearing about the 961’s for forever and a day. I work for the largest powersports auction in the country, about 5600 units a month, and after 3 years have yet to see ONE new Norton come through. These things are like unicorns, you hear about them, how wonderful they are and yet nobody has seen one. Well, to be fair, Norton has went through a few ownership changes that I know of. This latest has been going for probably a few years now as a very low volume manufacturer and hand builds their bikes. Unless you have a big, and I mean BIG company behind you with bocoo bucks for initial development and marketing (read Polaris) it takes quite a while to get there if you are lucky, and even Polaris started with one model initially. Except for the size of the dealer network, I don’t think most of the comments about this bike are fair. It’s styling looks very coherent. The themes and textures repeat throughout the entire bike. I’m no fan of inline twins, but this one is derived like others recently shown and accepted from a modern V4. It runs the now accepted crank layout and has class leading output without a ridiculous amount of marketing inflation. The styling looks more like a modern-retro take on classic company themes than does that of the Vaunted Ducati Scrambler. These bikes may end up being just a little more real than vapor ware, but the design and engineering elements seem well enough sorted out to be a pre-production concept from any of the big motorcycle companies. I dig it. Who cares what it costs? If you like it, you have the money, ride it. Most of the pointed negative comments slag the bike on a price/displacement ratio. Bigger/faster (though if those figures are accurate, it’ll be plenty fast) does not equal better or more valuable. This industry and many of its customers, cannot stop eating its young.. The gas tank indents are beautiful, I think it’s a good looking ride. $16,000.00 bucks for a 650 why not. You want fast by a Hyabusa or ZX 14, you want to be outside the cookie cutter crowd buy this, nobody stops and admires a Adventure motorcycle with this you get unique. Nice ride The only issue I have is the article says 11,000 rpm and the taco says 7500 too funny, Yamaha must be in charge of the rev counter. Pretty fuel tank but in the 21st century the only thing that assigns value to the Norton name is the unique look of an original Commando. These could just as well be a Yamaha, or Honda. Even the current 961 Nortons do not look quite right. High relative cost and no dealerships with inventory suggest another shallow attempt at business in America. RPM sounds kinda high to me for a mid size vert twin, with a 270 crank. Good Luck. Purists are impossible to please – I think they’ll be going after the other 99% of riders. If you want an old Norton, buy an old Norton. Purists may be picky, but not impossible. A purist is faithful to an original idea, in this case the concept of a motorcycle being an engine of transportation, that blends human intent with a natural flow thru the air. There is little to recommend the 99% ers content with bits and pieces cobbled together by black paint, water cooling, and the sense of security in not being original, rather all the same. Modern efficiency would be welcome, but not at the expense of that original idea. Another thought: with all the work to produce a machine of many beautiful, and complex parts, why compete with giants of manufacturing worldwide, and not set up a reasonable dealer network? More bullyboy Pommy rubbish . Bullyboy Pommy rubbish ? Is that a rodeo technical term ? Like it. I like the wire wheels, but $16,000 for a 650 twin? really, does anyone think this is going to be a hot seller? Especially something that “looks old”, and has dubious styling. Reminds me of the seventies when everyone just drilled holes in everything, come’on, what kid did they give the drill to. The headlight area, looks like a bowl of spaghetti. Yes, the noise in the video, what moron came up with that? I don’t know what it’s like in other countries, but Norton dealerships here are essentially pop-up shops. They have the staying power of dandelions. Not conducive to sustaining customer loyalty. I like both of them, but for greater than or equal to $13,000 for a 650? Uhh… no. Check out the size of the rear sprocket. This might be a super wheelie machine if it has such short gearing. Fun ride for a young skilled rider. Unless the rear sprocket relative size to the 17 inch rim is an optical illusion, something is wrong to have such a big ratio twix front and rear for a street bike. It is not just the street scrambler ( Ranger ). Makes me wonder if the get up and go is a little weaker than advertised. Why? A decade to late to the party, I go into motorcycle dealerships and see all kinds of 3 year old “new” models still sitting in the showroom and piles of lightly used bikes with no mileage on them. We geezers soon be riding wheel chairs and unfortunately youngins rather ride bikes on video games. Because they can’t afford it… The skyrocketing cost of motorcycling + non-existent wage growth = too much money. Any plans to bring them to the US? They’re nicely done and attractive compared to the usual Transformer/Insectoid styling standards, but given the price I have to wonder how competitive they could be in that class? Those are good looking bikes. Yep, just can’t understand all of the negative comments about these bikes. These are the lightweight, powerful and traditional looking bikes with the single round headlight at the front and lack of a beak that everyone lusts for on this site. So when they appear it’s, “Oh not for me, it’s too expensive, no dealerships, put together from spare parts, can’t hear the engine, etc, etc”. What the hell is up with you guys? We live in great times to have choices like this and these are some fantastic looking machines from an iconic brand! Oh, and get off my lawn! The problem, make that worry for me is Norton will wind up like Buell or Motus. I know by having that attitude can lead to low sales but I can’t help it. I like them. Not something I’ll buy, but nice looking bikes. They look like they were put together in a garage from random bits lying about. Yet another promo video where you can’t hear the real music. Do motorcycle marketing departments have any avid riders? Couldn’t agree more. It’s bad enough they don’t do a good walk around the bike, but you don’t even get to hear them.